Raggedy Ann was a character dreamed up by the late American writer Johnny Gruelle (1880–1938) who featured her in a series of illustrated children books that became very popular with kids because Raggedy Ann isn't just any ordinary rag doll. Fan's recognize the intriguing fictional character for her cute triangle nose and red yarn hair. She inspired the creation of her doll in 1915 and the book called Raggedy Ann Stories introduced her to the public in 1918 along with a doll of Raggedy Ann, making it a very successful market. This success lead to a sequel in 1920 entitled the Raggedy Andy Stories that introduced Ann's brother, Raggedy Andy, who dresses up in a cute sailor suit. These stories inspired a variety of different raggedy costumes for Halloween so people of all ages can dress up as their favorite childhood character. If you need a classic Halloween costume or clothing like the characters, browse through our recommended costumes for sale. 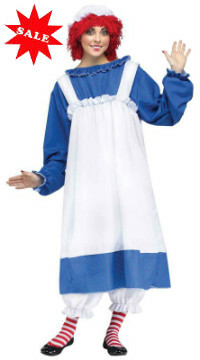 This adult size Raggedy Ann Costume includes a hat with wig, a single piece blue dress with white polkadot design with apron, bloomers, striped red/white stockings. Women's dress size 14. An officially licensed Raggedy Ann product. 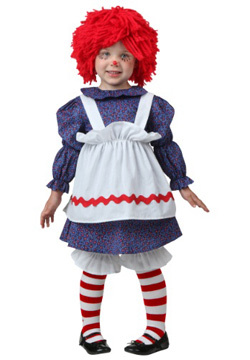 This is the classic Raggedy Ann costume dress for girls. It's just like you see in the children storybooks that girls love to read. 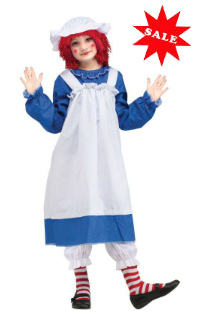 It comes with the blue dress with white apron, red/white striped socks, and white bonnet with red yarn hair. This outfit is available in small, medium, or large sizes. This cute child size Raggedy Ann dress costume features a blue floral print calico dress with back zipper, white apron, red yarn, white bloomers, and striped stockings. Available in infant and toddler sizes: 12 months, 18 months, 2T and 4T. 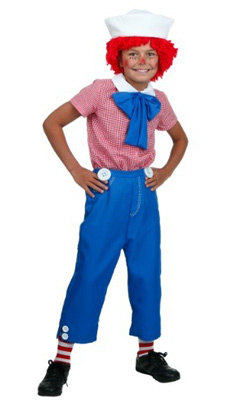 This affordable and complete child Raggedy Andy costume for boys includes the red/white plaid shirt, large collar, blue bowtie, elastic blue pants, red/white striped socks, and white hat with red yarn wig. Available in boy sizes 4T, small, medium, large, and x-large. 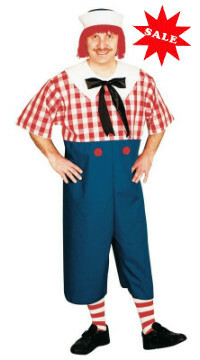 This adult men size Raggedy Andy Halloween costume features red/white checkered shirt with attached blue pants, striped stockings and a hat with wig set. Officially licensed. 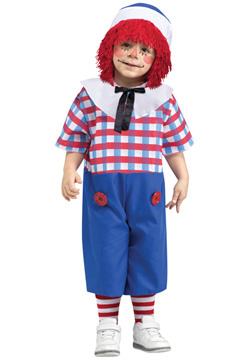 This toddler size Raggedy Andy costume includes a checkered pattern shirt with attached blue pants, cute attached black bow, red white striped stockings and a hat with red wig. 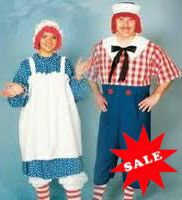 This is an officially licensed Classic Raggedy Andy product.